Field Elementary, home of the Mandarin-immersion program, is having its second annual fall festival on Saturday, Oct. 26, from 4-7 PM. The fair features a vendor and craft fair, the Pasadena Symphony Brass Quintet, along with games, prizes, crafts and the "Rock 'n' Roll Robots." 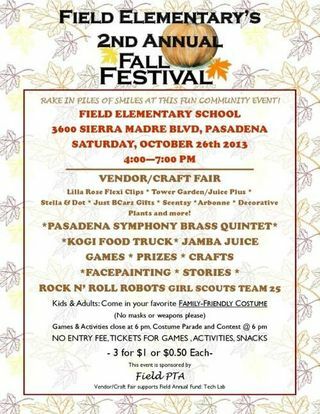 Field Elementary School is at 3600 Sierra Madre Boulevard, Pasadena.